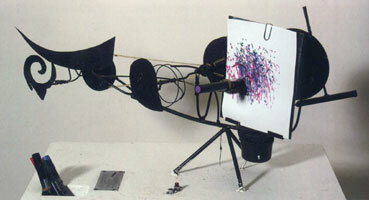 One of the Meta-matic machines by Tinguely. Machine - See algorithm, automaton. < L'art et la machine. Danièle Meaux ed. Figures de l'Art 32. 2016. Good insights in history, but a strikingh absnence of digital art. < Image, process, performance, machine. Aspects of an aesthetics of the machinic. by Andreas Broekcmann 13 pages in [Grau]. - Finite state machines in interaction programming, see [Thimbleby]. - Machine model in interaction design see [Janet Murray]. < The Myth of the Machine. The Pentagon of Power. Harcourt Brace, New York 1970. < Réflexions sur la science des machines, by Jacques Lafitte, Vrin 1972. < Fonction du cinéma. by Elie Faure. Editions d'histoire et d'art, 1953. Augmented edition Gonthier 1963. < Défense et illustration de la machine, by Elie Faure. An essay included Regards sur la terre promise, a collection of texts. Paris, Jean Flory, 1936. and also in Fonction du cinéma. Editions d'histoire et d'art, 1953, augmented edition, Paris, Gonthier 1963. - La grande révolution qui vient. by Jacques Duboin. Editions nouvelles 1934. - L'homme et la machine, by Nicolas Berdiaeff, Editions Je Sers, Paris 1933. - La grande relève des hommes par la machine. by Jacques Duboin. Les Editions nouvelles, 1932. - [Sakarovitch] says that a machine is a finite dimension algorithm. Machinima. 3D animation created in real time, using game engines. Wikipedia. Somehow a form of transmedia. New magic: Notte, by Raphael Navarro and Clément Debailleul. Magic. . See special notice. - A form of calligraphy. Not digital. It could be translated in "postal art". See Website. - The term has been used, more conceptually, to describe art where the works exists only by its relationships with the Postal Institution. It was presented in the book "Mail art, communication à distance, concept", by Jean-Marc poinsot (Editions Cedic, Paris 13e). Among the artists presented in the book, On Kawara. Mainstream. The title of [Martel] book, covering, to be brief, studio films. Hollywood at the core. Maintenance. The term is rarely used about art pieces, even though many digital art works need it. See perenniality. - Ianis Lallemand uses the term "auto-maintenance" in his vision of design. Making of . A film or other media showing parts of the film in the making. Frequently added on DVDs as a kind of bonus. < How to draw manga - with Photoshop. A guide, divided in chapters, to draw manga for beginners. Online. - Mapping of a 3D image (e.g. a texture) onto a 3D object. May be used for rendering of perspective. Marble. Modeling of these textures, long developments in [Ebert]. A debate on digital market, organized by Digitalarti in 2010. Market (art), marketing. See special notice. - Markov chains play an important role in AI, then in their art applications. - Markov field [Bres] p. 76. Mastering. Making and copying master discs. 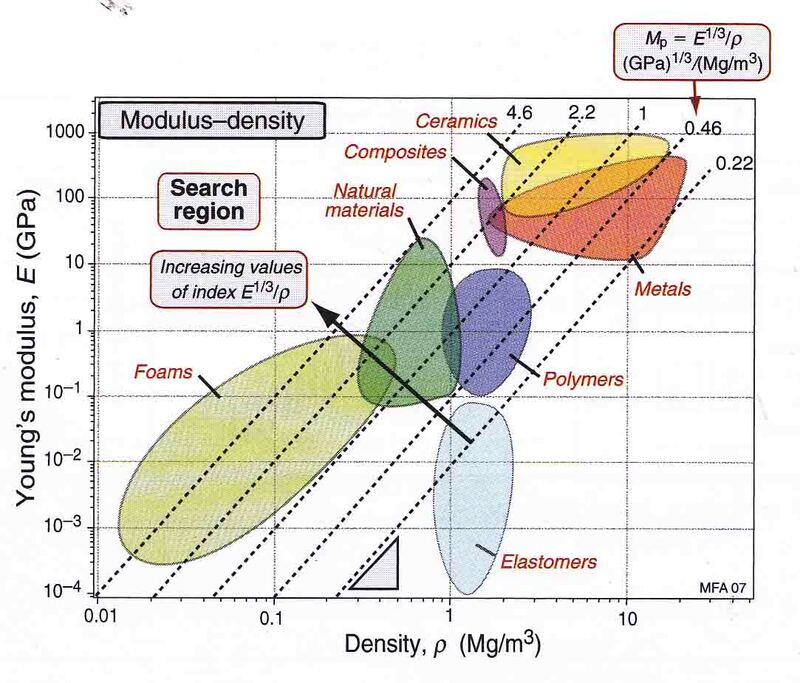 Materials, today, are more diverse and more complex. Here one out of many graphics in the book Materials, engineering, science, processing and design. Computers let use them in sophisticated and adaptive manner. That'is important for architects and designers in general. Material. The term is used for software as well as for hardware. A part of technological progress consists in an always more important use of synthetic materials. - Some providers of materials and tools for plastic artists in Paris: see our geographical guide. - Materials representation can be taken as a kind of texture. < Material strategies in digital fabrication. Chrisopher Berkrem. Routledge 2013. < Material Computation. Guest editor: Achim Menges. AD, Architectural design, March/April 2012. - Composite or smart materials are generally elaborated using all sorts of computer equipment [Picon] p. 159. < Materials. Engineering, science, processing and design. by Michael Ashby, Hugh Shercliff and David Cebon. Elsevier 2007, 2010. A substantial book about physical materials. Theory and practice. < Matériaux de Paris. L'étoffe de la ville de l'Antiquité à nos jours. by Bernard Marrey. Parigramme 2002. Of historical interest, not digital). Materiality. As different of physicality (types of materials) "in bein and emergent property... a human-technical hybrid" [Hayles 2012] p. 91, referring to Kirschenbaum, who distinguishes also formal materiality. Maths, mathematics. See algorithm, geometry. - Reading Wikipedia, Math Rock does not look digital at all. < Mathématiques et technologie. by Christiane Rousseau and Yvan Saint-Aubin. Springer 2009. On the summary: friezes and mosaics, movements of a robot, random number generators, Google's PageRank, image compression by iterated functions, the JPEG standard, the DNA computer. < La mystification des sens. L'art sous le regard mathématique. by Francisco Casalderrey. Barcelone. RBA Collectionable 2011. Popular kind of book, but with some useful pages, notably about the Renaissance painters (Piero della Francesca, Alberti, Botticelli, le Greco, Zurbaran et Velasquez). < De l'autre côté du miroir. La symétrie en mathématiques. by Joaquin Navarro. Barcelone. Collectionables 2012. Popular mathematics, but symmetry matters in art. - According to Wikipedia, it does not seem that Math Rock be digital enough to be entered in this dictionary. - Application to architecture, see [Burry]. Mattes use is a way of combining different images (still or animated). Typically, a blue or green background is used, in order to keep only the main subject, which afterwards can be brought upon any background. 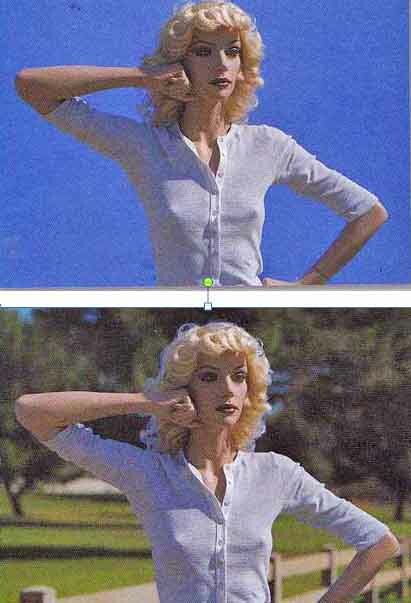 Here pictures from the big book by Ron Brinkman: The Art and Science of Digital Compositing, Morgan-Kaufmann 1999. - A layer, or channel [Brinkmann]. - Matte painting: a painting technique, by layers. < Matte painting (Artist collection), by Daniel Wade (ed.). Mylor (Australia), Ballistic , 2e edition 2005. The work gives space to 3 artists : Dylan Cole, Alp Altiner et Chris Stoski. < Le Matte painting. Ateliers créatifs. DVD by Ludovic Iochem. Elephorm 2011. - Max MSP See Cycling 74. - Robot Max. a Pierre Berger creature. MBT. Measures, beats, tics . A way of slicing time in music software. MDL. (minimum description length). [Siarry]. - Physical devices , sensors, calibration tools (voir calibration). - Systems measurement in "ops (a tentative approach by Pierre Berger). Mechanics, and mostly today micro mechanics give wings to the creators. 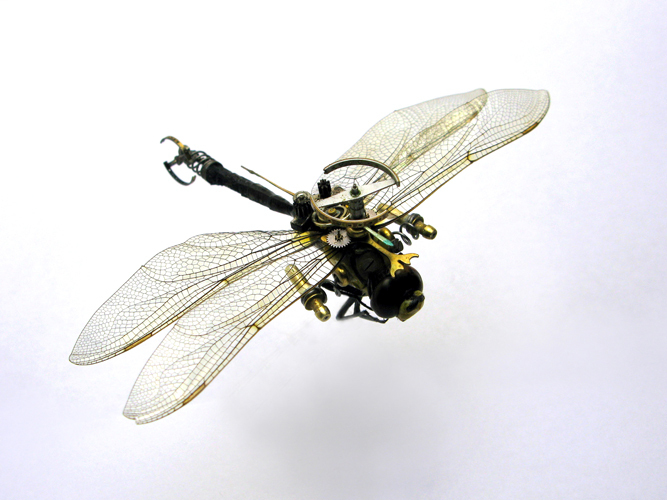 Here, according to Design Spartan, a dragonfly by Mads Petersen. Alas, it is only an artistic concept, with no real objects. Mechanical technologies (pulleys, gears...) were ill adapted to digital operations. Babbage, for instance, lost his fortune in this kind of researdh (19th century). But, frop antiquity to the 1960's, the give vay to more and more complex machines. Artists did use them to build artistic automata, astronomical clocks, and finally kinetic art. - Geometrical concept (the three median lines of a triangle). - Statistical concept (rather like an average). - A category of filters, taking for each pixel the median value of the nine (or any square number) pixels surrounding this one. Source code in [Roxame]. Comments in [Brinkmann]. It is a form of convolution. - Mediations takes a growing part in the presentation of art to the different publics. It may be done by professional or temporary human mediators. But the web itself if a sort of global mediator. - Médiation numérique, symposium, presentations at Gaité Lyrique (3 and 4 May 2011, and former years). - Assises de la médiation numérique . Ajaccio, September 2011. - Un moment voulu. French national association of persons in charge of audiences in relation with contemporary art. Member (body). Textural animation of members, gestures [Ebert]. Memory, to stay, calls for long term curating of digital documents. Here on of the studios at Ina, picture by Batfredland. Memorable, memory. See special notice. Mesh. Generally: triangle, square, hexagonal. - Polygon Mesh Processing by Mario Botsch, Leif Kobbelt, Mark Pauly, Pierre Alliez and Bruno Levy AK Peters / CRC press 2010 c.
- See also Meta/Data, by the VJ artist Mark Amerika. 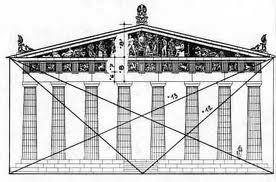 Measurement is a demand of art, here an image of Athen's Parthenon, according to Ingrid Mepuis. Metawork. Deprecative term in general (see Urban dictionary"), the term could don a new meaning with the transmedia and the mixing practices of DJs and VJs. - "A meta-work... a composite work, at the same time linking, stringing, embedding, contraction and summing up of different parts which have been necessary for its elaboration" ([Leloup, 2013] p. 36, our translation). - Chessboard [Cocquerez] p. 42. - [Agoston], [Marcel Berger], [Brinkmann]. Metropolis. A simulation algorithm [Cocquerez] p. 386 and [Siarry]. - In the late 1970's, the microfiche (a card of microfilm, 105x150mm) was tentatively used as a media. < Paris et ses environs. 45 views, published by Kodak Pathé, 9/1973. Microphone. Invented in 1878 for the telephone. First recording of digital instrument, 1919. [Moorefield] p. 2 notes that the transfer from mechanical recording to the electrical one caused the same nostalgies that the transfer from vinyl to CD at the end of the XXth century. - In a studio, transparency and background noise absence of digital mikes is not much a selection criteirum. On the contrary, sound engineers will racher choose non linear mikes according to their color, their contribution to the sound "matter" that they wish to sculpt during the recording. On the other hand, on live playing, on a string section for example, the absence of murmur, the high dynamics and the possible telecontrol of mike functions through the AES42 interface (LPF, attenuation, compression, limitation, gain...) is apreciated." (Our translation from a non signed article in SonoMag 371). Mixing. Now, the analog aspect of the tables hides digital devices inside the casing. Mix, mixing. See augmented, hybrid. - Typical of the digital magma, see [Leloup, 2013]. < Mixed Reality. Merging Real and Virtual Worlds. by Yuichi Ohta and Hideyuki Tamura (eds.) : Springer 1999. 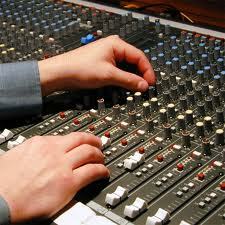 - Mixed music: works that combine instrumental and electronic elements). See for example an Ircam program, saying that here "Musical analysis has found a slippery element in this history: the coexistence of two sonorous worlds and two types of notations, difficult to perform, multitudes of technological paradigms, rapid obsolescence of the necessary technical means, etc.". - Creation on mobile devices. 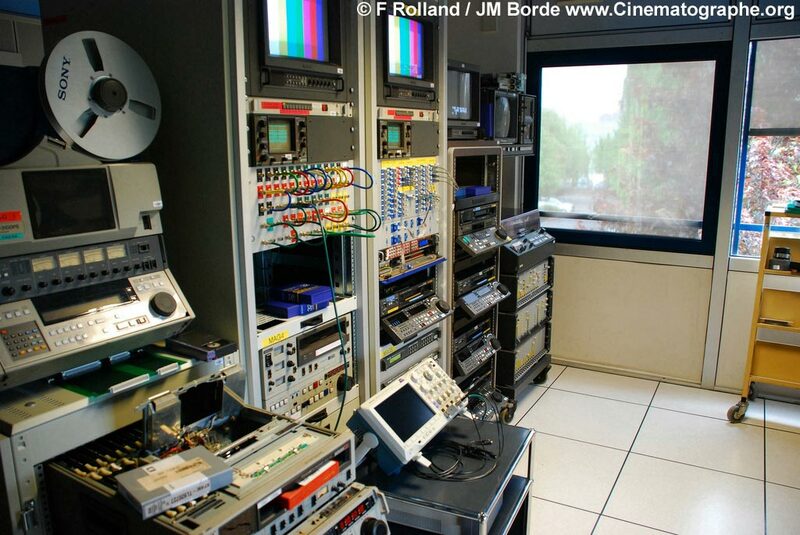 An article about the Mobile Roadie tool in Créanum April-May 2011. - History: See cinetic art. Mocap. Motion capture. See capture. - Modeling the body: poser, canon..
- "Guitaristic modeling", by the Line 6 company. An article by Eric Chautrand and Thierry Demougin in KR home-studio, June 2011. - The Christmas crib at the Frères des Ecoles Chrétiennes, in Fonséranes (near Béziers); the set of mechanisms has been developed since 1937; in includes today 90 mechanisms, with a digital contrl (a topped CD-Rom). - Quoted by [Berger-Lioret] p. 35. < Quand le moderne n'était pas un style, mais une cause. by Anatole Kopp. ENSBA, Paris, 1988. Mojoworld was used to build this image (from a tutorial in Bitwise Magazine. Moment. 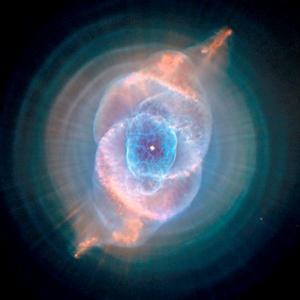 The space moment is a feature of a region [Cocquerez]. - Of one color only. - Major works : :Alphonse Allais, Yves Klein. - From the humor of Salon des Incohérents to the near-mysticism of Aurélie Nemours. Monte-Carlo. As a sampling method [Ebert]. < Electronic Monuments. by Gregory L. Ulmer. University of Minnesota Press 2005. - See light, architecture, mortuary, perennity. Mortuary: a photo by the composerPatrick Broguière of the Mémorial de la Guerre d'Algérie, quai Branly à Paris. Moon. Modeling of its surface [Ebert] p. 473 sq. Moran. [Bres] p. 385-387. Criterion for image comparison. < Le morphing sur votre PC. by David Mason. Eyrolles 1994. - A chapter in [Cocquerez] p. 389-403. - As soon as the 1990's, it could be imagined to replace marble and stone by screens, which would show visitors a sort of "best of" about the persons here buried. But, up to now, i t is forbidden, condidered as a form of "commercial". - Another way using new medias for our lost parents of friends is now proposed by laviedapres. "This concept let build the image you intend to show of yourself, and constitute a digital patrimony", François de Closet says (Le Parisien, 1/11/2010, our translation). 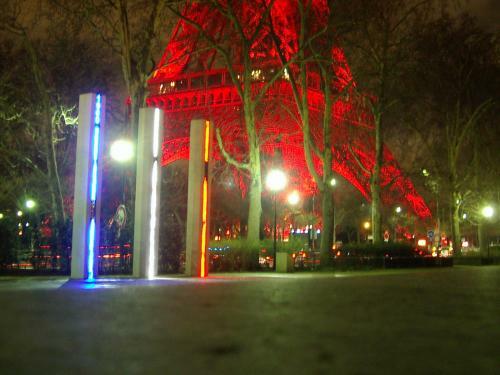 - Digital art can also be used for public monuments, like the Mémorial de la guerre d'Algérie, in Paris. Motion capture, an image on Niceboard. 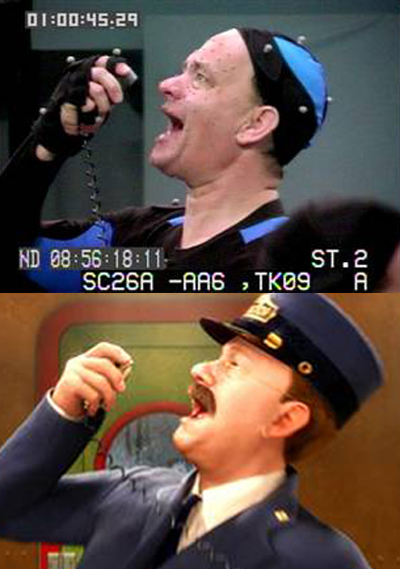 Higher half: the actor, equipped with sensors. Lower half: the result after combination with a model. < The mouse faces extinction, according to the Washington Post (2012/10/07). - Art, ordinateur, mouvement. Emergence de nouvelles esthétiques du mouvement, by Alain Lioret. L'Harmattan 2004 SH No 27 (concepts). - See effector, animation, robot , kinetic art, mocap. Move. See kinetic art . MP3. A standard music format, for storage and also for a kind of portable readers. Multi-agents. A type of system architecture. See agent. Multicast. Technical distribution mode on the Net. - Multicast multimedia sur Internet. A. Benslimane ed. Hermès-Lavoisier 2005. SH No 47 (concepts). - Olivier Auber has used multicast for cooperative creation works. Multifractales. Explained by [Ebert] . 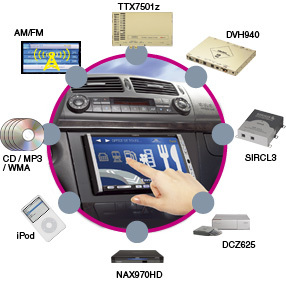 A way of seeing multimedia: use of different hardware. More content oriented, multimedia means rather multi-sensorial, or multimodal. Multimedia, multimodal. See notice, and transmedia. Multiresolution. Often quoted by [Bres]. Munsell. A color space. See color, [Zelanski]. - See Icom and its Avicom colloquium. < Du musée conservateur au musée virtuel: patrimoine et institution. by Corinne Baujard. Hermès-Science 2013. - Les musées s'animent (Animated museums) . 9 pages of papers in Sonovision, May 2012. 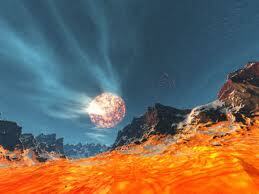 - See geographical guide for a selection of the most important for digital art. 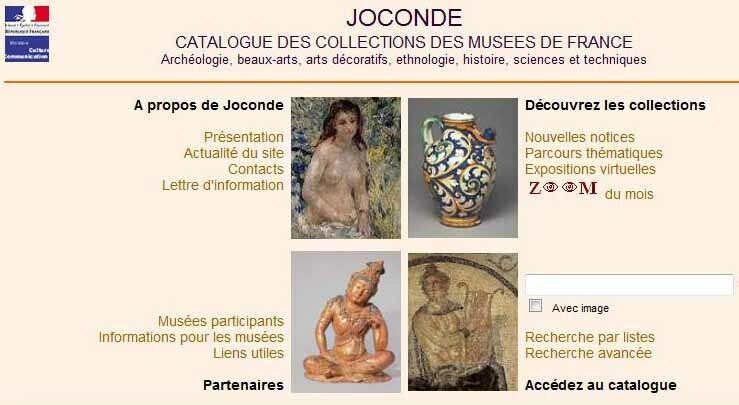 - Joconde French musems on line catalog. - Le netart au musée - Stratégies de conservation des œuvres en ligne. by Anne Laforet. Editions Questions Théoriques, 2011. - Musées et parcs, la convergence? 12 pages, by Annick Hémery, in Sonovisionn, May 2011. - Opening the Adobe Museum of Virtual Media (fin 2010). - Several pages on virtual museums in Icom bulletinIcom SH No 25 (concepts). - Virtual exposition "Messages des pierres à travers l'Europe" AH No 115 (Détente). - Unisys Museum in Brussels AH No 93 (concepts ) and AH No 90 (concepts). - Computer virtual museum . AH No 84 (concepts). Museums invest in digital techniques for a lot of different aims. Here, a web access to the catalogs of collections. - Creating interactivity of our heritage stored in Museums Experimentation with Château des Ducs de Bretagne History Museum of Nantes, by Florent Laroche and Jean-Louis Kerouanton. Communication at Laval Virtual 2010. On line. - Le musée imaginaire by André Malraux (Gallimard 1965). - Musée numérique et ville numérique: racines, parcours, interaction. A paper by Pierre Berger in "La ville numérique", Victor Sandoval ed. , Hermès 2000. - Interactifs. Fonctions et usages dans les musées. by Bernadette Goldstein et al. Direction des musées de France. 1996. - Du musée imaginaire au musée virtuel. by Philippe Pataud-Celerier. Lynx-Edicom 1994. - Informatisation des musées et beaux-arts en Suisse: tentatives ou tentation? by E. Pittet. Marendaz, Le Mont/Lausanne, 1984. - An anchoring point for l'Hypermonde. (1989). - Musix III in 1959, then Music IV. - Music V presented by Mathews in 1969. The user builds an hypothetical instrument. MXF. Transfer and media exchange standard.